Yet another supply chain source has chimed in on the 2018 iPhone release lineup, with it claiming that based on component orders, the 6.5-inch OLED 'iPhone X Plus' expected in the fall will hold the lion's share of sales. The report the Korean Language trade publication The Bell is seeing 45 million panels for the high-end 6.5-inch device, just a little less than half the screens ordered. IF the reports are accurate, Apple has ordered about 25 million screens for the smaller 5.8-inch OLED device, and 30 million 6.1-inch screens for the LCD release. The Bell does not have a reliable track record for predicting Apple's future iPhone plans. Other reports attributable to the publication include an unverifiable claim from 2017 that Apple was working on a foldable iPhone with LG for release in 2020, as well as the only claims that the 6.1-inch LCD iPhone slated for release in the fall alongside two OLED models will ship later because of issues cutting a notch in a LCD screen. It's not certain how these numbers compare to Katy Huberty's predictions from Monday, of Apple ordering 90 million iPhones spanning the launch quarter for the 2018 iPhone rollout. The screen orders cited by Tuesday's report may be for a longer period, or include screens set aside for service purposes. Most sources now claim that all three will have the TrueDepth camera array and use Face ID, but the LCD model will be singled out as a cost-effective model while the OLED versions will have more premium pricing and specifications. Two report sources claim that, in order to avoid any manufacturing delays that allegedly occurred during the initial production of the iPhone X, suppliers were informed by Apple to prepare for the two OLED models earlier than "normal" in 2018. Increased preparation ahead of production could fend off component shortages and quality control issues that were said to have caused last year's manufacturing problems. There is some speculation that the LCD model will be delayed, due to production yield issues surrounding its touchscreen functionality, but the situation is apparently improving. Bottlenecks in integrating the TrueDepth camera array into the LCD screen are also said to be easing, removing another hurdle that could cause manufacturing delays. Foxconn will continue to be the main iPhone assembler this year, with it said to handle all 5.8-inch OLED units and 80 to 90 percent of the 6.5-inch OLED version, as well as 30 percent of LCD model orders. Pegatron is identified as taking 60 percent of the LCD orders and between 10 and 15 percent of the 6.5-inch OLED model orders, while Wistron makes up the remainder. The 5.8-inch OLED model is said to be priced be around $800 to $900, with the 6.5-inch OLED "iPhone X Plus" priced between $900 to $1000. The LCD model is likely to be between $600 to $700, according to the supply chain as well. Apple CEO Tim Cook has previously spoken out about such reporting and supply chain analysis, advising that industry observers should avoid relying too heavily on these types of rumors. "The supply chain is very complex, and we obviously have multiple sources for things," Cook advised in 2013, adding that some reports could were likely based on a "single data point." This appears to be the new safe harbor statement for product rumors. looks like they are going to try to force a large phone on those that don't want it and have to pay more for OLED just to get the smallest screen. iPhone X shows best cameras would fit in nonplussed phones but they still pushed them as up sell. That sounds like a full-year order for the OLED panels. The X is on track to sell a total of 40 million in its initial year, and this was supposed to be a supercycle. You've also got multiple reports saying the LCD device is expected to be the most popular which this report contradicts if the orders are for the same period. Sales have been stagnant since the iPhone 6. Next year's sale will likely be in the 215-235 million range. I'm thinking the OLED devices will account for about 25% of that total (around 60 million) split 40M for the plus and 20M for the regular which pretty much matches this report. However, I think the new LCD device will account for about 1/3 of sales next year which would be about 75 million units. Maybe Apple is playing it safe and starting out slow, or maybe Apple is more confident in acquiring sufficient panels on short notice, but either way I bet 25 million is woefully short of what Apple will actually sell next year. If it does sell in the $600-$700 range I bet Apple drops the iPhone 8 from the lineup and keeps the 7 around for the $500 price point. You can get an SE or wait for the new SE for a smaller phone. No need to get a “big screened phone”. As for me, I will keep my 7+ for another year (after replacing the battery before the end of the year) but will be happy to get an “X+” version someday. I guess the rumor mill finally got enough egg on their faces to change their tactics. You are free to purchase any smartphone you choose if you think Apple is evil and manipulative. Become lemmings and move to Android. Yes, because Tim Cook will come round to your house and beat you repeatedly with a rubber chicken until you buy an iPhone. Read the Daily Mail, it's all there: assaults with flexible artificial poultry rises round about the time of an iPhone launch. Oh so you mean, like, at gunpoint? Or that they kidnapped a loved one? Have you considered contacting law enforcement to report this extortion? Or or are you just full of it? Yeah. It’s a free market, dude, buy what you want and vote with your wallet. But because the X was the best-selling iphone it seems many are voting differently than you. Did they discontinue the SE? I don’t believe these numbers for a second. Not just the quantities but the pricing. The quantity claims are ridiculous. Yes, the larger 8 Plus outsold the iPhone 8, but not by much. To think the X Plus will outsell the X 45 million to 25 million is not credible. And to claim the OLED phones will outsell the LCD model 70 million to 30 million is unbelievable, and nothing short of ridiculous. The LCD model is likely to be between $600 to $700, according to the supply chain as well. This statement is absurd. Since when does Apple share their retail pricing with the supply chain? There’s no way the LCD phone prices at $600. What, Apple’s going to take the iPhone 8, increase the display size from 4.7” to 6.1” and add FaceID—and simultaneously knock $100 off the selling price? In what world does that make any sense whatsoever? $600 is the price the 8 would normally sell for this September, after a $100 drop. The 8 Plus would normally drop to $700. If the 6.1” LCD is $600, what happens to the pricing of the 8/8 Plus? $450/$550? There’s no way they can do that and retain anywhere near the current margin, and we know Apple is all about gross margin. As the $699 iPhone 8/$799 8 Plus replacement, the 6.1” iPhone 9 Plus will sell for $749. I don’t even think $700 is possible; there’s a lot more BOM cost in that thing than the 8 has. The X Plus won’t be any lower than $999. Apple had its best selling model at $999 this year with the X; an X Plus at the same price is an outside the park home run. To claim it could sell for $100 less than the X did this year is not believable. Sorry Apple, just not interested in a phone bigger than the iPhone 7/8. These fit in pockets etc nicely but anything bigger is IMHO, a total waste of time for me. FaceID does not work when I'm wearing protective head gear so it is useless. All my biker friends hate it. TouchId was perfect for us. I guess that the iPhone 8 will be my last Apple phone. Sad. so sad. Why do I feel that there is more pent up demand for a 4.7 - 5.0” X style screen in the body of an SE, than for three screen sizes which aren’t very different? I have an X and would prefer something smaller that fits more comfortably in my pocket. I feel that a 6.1” screen is too close in size to the 5.8” and 6.5” screens, and would be surprised if the size of the phone, rather than its price, would be the deciding factor for potential buyers. I won't be buying that one either. The sweet spot is long gone (iPhone 4 size) and I don't care for my iPhone 6s physical design (the appearance is hidden in a case, per requirement to make the damn thing not slippery and comfortable in the hand, and the size forces me to use two hands to operate everything else other than talking on a voice call). I don't want FaceID replacing TouchID, and I hate the extra gesture complexity demanded with the loss of the home button. Apple will eventually force me to buy another one, and Droid will never be an option for me, but it's not going to be for a couple years yet that I'm forced into another phone, I hope. I will keep my X until 2020 in the hope that touchID in the glass will come, FaceID is ok but wish we had Both. I do like the fact Apple will give customers options this year. It's been this way for many years but it has never stopped the constant rumors, negative or otherwise. Don't those cause cancer? 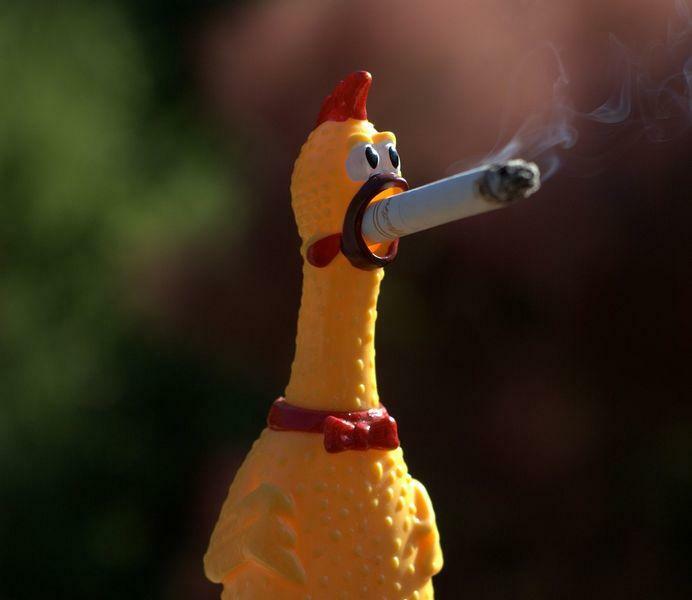 The rubber chickens I mean, not the cigarette. And according to the Daily Express a rubber chicken may have been involved in Diana's death. Something substantially larger than my beloved X will take some selling. You can be critical and still like Apple products. It doesn't mean that they want to leave their platform of choice. It's also true that this is just a rumor and you should probably wait until the next iPhones are announced before making any rash decisions. It's still taking me a while to process that "2018" refers to this year! And we're half into the year already. Damn, I'm getting old.